Combine the cream and star anise in a pan and bring to a boil. Remove from heat and set aside to infuse for 5 minutes. Melt the milk chocolate over simmering water and remove from heat. Add the honey (without stirring). Strain the cream into the melted chocolate and honey. Beat with a wire whisk until creamy. Add the butter and stir to mix until very smooth. Pour to a depth of 2cm in a parchment paper-lined pan. Cover with clingfilm and refrigerate for 2 hours. To form and finish the truffles:} Cut the cooled chocolate ganache into 2cm cubes. Melt the dark chocolate. Using plastic or surgical-type gloves, roll the ganache cube into a ball and dip into the melted chocolate to coat ball completely. This final dipping in chocolate will give your truffles a delicious crunch as you bite into it. 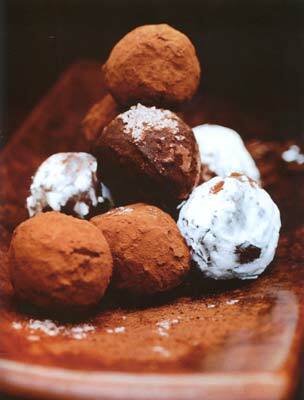 Roll in the cocoa powder or icing sugar, or a mixture of both for a varied look. Line the truffles on a parchment paper-lined tray as you complete them. Store in the refrigerator and consume within 3 days. For more food and wine stories and recipes, pick up the latest issue of Flavours (Nov – Dec 2005), Malaysia’s premier food magazine, available at major bookstores and newsstands or email cir.ccu@thestar.com.my for subscription details.